Habit: Shrub (climbing or not), tree, thorny or not, generally glabrous. Leaf: simple, opposite or alternate, deciduous to persistent, subsessile or petioled; veins pinnate. Inflorescence: cluster, cyme, raceme, panicle, or 1-flowered, axillary or terminal, bracted. Flower: generally bisexual, radial, small; hypanthium +- cup-shaped; sepals 4--5; petals (0)4--5, free; stamens 4--5, alternate petals, attached below or to rim of disk; ovary superior or +- embedded in disk, 2--5-chambered, placentas axile or basal, style generally 1, short, stigma +- head-like, 2--5-lobed. Fruit: capsule, winged achene, berry, drupe, or nutlet, often 1-chambered. Seed: generally 1 per chamber, arilled. Genera In Family: 50 genera, 800 species: worldwide, especially southeastern Asia; some ornamental (Celastrus, Euonymus, Maytenus, Paxistima). Habit: Shrub, prostrate to ascending. Stem: twig 4-angled, with corky ridges. Leaf: opposite, evergreen, leathery, finely toothed. Inflorescence: axillary, 1--3-flowered. Flower: parts in 4s; petals +- white to red-brown; disk fused to hypanthium, +- square, fleshy; stamens short, attached to disk margin; ovary embedded in disk, stigma lobes 2, obscure. Fruit: capsule, loculicidal, 2-valved. Seed: shiny, dark brown to black; aril surrounding base and 1 side of seed, white, thin, fringed. Habit: Plant 3--10 dm. Stem: prostrate to spreading, +- stiff, densely branched. Leaf: petiole +- 1 mm; blade 8--34 mm, ovate to oblanceolate, base tapered, tip rounded to acute. Inflorescence: peduncle 2--3 mm. Flower: petals +- 1 mm, ovate. Fruit: 4--7 mm, obovoid. 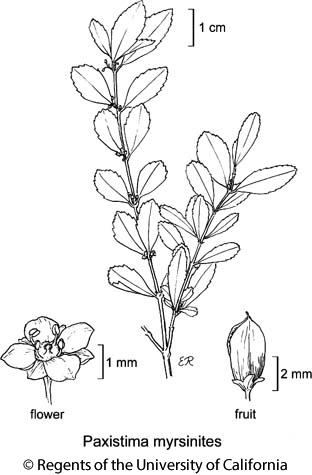 Citation for this treatment: Michael A. Vincent & Barry A. Prigge 2012, Paxistima myrsinites, in Jepson Flora Project (eds.) Jepson eFlora, http://ucjeps.berkeley.edu/eflora/eflora_display.php?tid=36518, accessed on April 22, 2019. NW, CaR, n&c SN, n SnFrB (Marin Co.), MP; Markers link to CCH specimen records. Yellow markers indicate records that may provide evidence for eFlora range revision or may have georeferencing or identification issues. Purple markers indicate specimens collected from a garden, greenhouse, or other non-wild location.